The war is finally over, and the boys at Aaron’s Brooklyn yeshiva are more interested in basketball and comic books than world affairs. Into their tight-knit circle comes Daniel, an orphaned Holocaust survivor, who, along with twenty other Polish refugees, will be sharing already crowded dorm space with the American boys. Daniel is quiet, obviously bright, and strangely attached to a metal box that he carries by day and keeps under his pillow at night. Aaron, who stutters, empathizes with the odd outsider, but the other boys are rougher and swipe the box to examine its contents. What they first mistake as a greasy rock is actually a brick of soap, which Daniel believes may have been rendered from the remains of his parents who perished in a concentration camp. This slim, compelling volume, based on the experience of Rabbi Rafael Grossman, feels more like a parable than a memoir, and readers won’t want to miss the end matter’s touching, humane coda to “Daniel’s” tale, which testifies to his eventual emotional recovery. Full-page watercolors with an air of picture-book innocence, combined with a light page count, may attract young readers, but children who have already been apprised of Nazi atrocities will be better prepared to grapple with the revelation of Daniel’s heartbreaking keepsake. Greenhorn is available in hardcover and all ebook formats direct from NewSouth Books, Amazon, or your favorite bookstore. Publishers Weekly’s “Soapbox” column featured an essay in late September by Anna Olswanger, author of Greenhorn and the award-winning Shlemiel Crooks, both published by NewSouth’s Junebug Books. 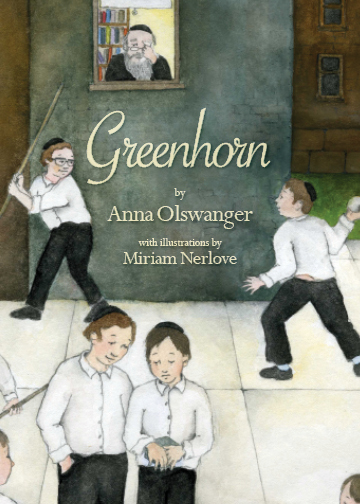 In “A Story of Hope,” Olswanger talks about how she was compelled to turn a true story of tragedy into Greenhorn, a book about hope; she also discusses her surprise at a publisher willing to release a children’s book about the Holocaust when so many others would turn it down. Read Anna Olswanger’s full essay at Publishers Weekly. You are currently browsing the NewSouth Books weblog archives for December, 2012.